It covers extreme challenges on verbal discrimination, come to hand, threadles, pushes, obstacle discrimination, tunnel traps and weaves. It comes together with 17-page pdf file with many different sequences, mostly requiring minimal space and equipment, so it's easy to implement in your normal training. The DVD is 50 min long, plays everywhere in the world and can be shipped anywhere. How much space do you need to practice for this class? Try to get Proton some winter exercises. For some, living room is enough 🙂 For the most of the rest, you need something big enough to for weaves or a straight tunnel + some jumps for example. I’m wondering when do you stop cueing every jump individually? At the beginning with agility training I say ‘jump’ for every jump Sum has to take, to help him know he has to take it. And ofcourse use cik/cap or left/right if needed instead of ‘jump’ cue. But when courses get harder it might be better or easier to not have to cue every single jump? So at which point in training should I stop cueing individual jumps, or should I still cue some of them? Is it possible to purchase direct download via PayPal ? I have just downloaded the DVD but I am missing basic “how to” information to start learning. I only see a pile of video’s with some comments but to me this information is more suitable as documentairy after taking a seminar or class. Perhaps it is just me or I am dumb but this does not work for me… I was interested in how I should start working on the subject and not just showing how you do it. Perhaps better show examples on how things can go wrong and how to prevent that to be abe to focus how things should be addressed properly. Do you have Foundations Fun DVD too? Maybe Xtreme is just too advanced to start with? I do show very beginnings of training those new skills with my dogs, mistakes included + describe how to make things easy at first and how to add difficulties gradually enough in order to avoid things going wrong in the first place -- so not sure what more you would like to see? Other as maybe the very basics, but that’s covered in Foundations… Also, for more trouble shooting, classes are much better as DVDs as there are more dogs and therefore more different possible problems addressed. I am only eiger to learn how to handle even better! But perhaps I am missing your way to teach foundations making it all a bit fuzzy for me which you take for “granted” assuming that everybody has the Foundations DVD and started from there. 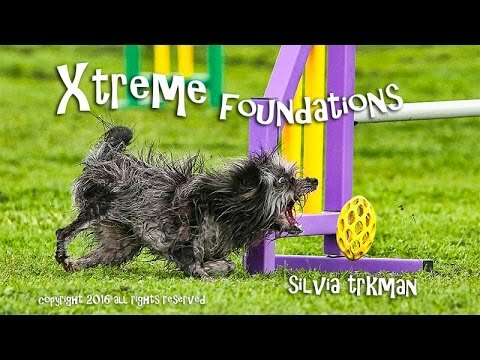 Not to sound negative, it is just how I feel and which is being a bit dissapointed about the missing learning curve to understand the lessons on the Xtreme DVD more clearly. Sure, I appreciate your thoughts and agree to some degree! If I was making it now, I would certainly add more trouble shooting on things that proved the hardest for people to train in Xtreme Foundations class (especially on verbal discrimination! ), but this DVD was made before the class started, as a program for the class. And yes, additionally Xtreme DVD a kind of bases on presumption that the viewer knows my cik&cap concept and threadles. The rest is not that specific -- weaves chapter for example shows nicely how to add difficulties to any dog with decent weave understanding, regardless of the method used, no? This DVD is about training though, NOT handling, so it all takes time and practice.